On a recent trip to Cornwall to see relatives, I managed to bag myself a day out on my own; I had decided that I "needed" to paint an engine house. 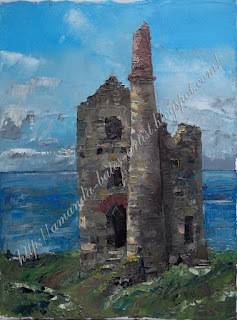 Not having painted such an iconic symbol of West Cornwall before, I opted for a rather touristy image of an archetypal engine house - all roofless, pointy eaves and tall, broken chimney, standing steadfast on a cliff top with the sea behind it. This was painted en plein air, with me nestled in a break in the hedge right by a junction where two or three footpaths met. I sat on the dry ground (it was a sunny day, and the area hadn't had rain for some time) and tied my stool onto my abbreviated easel to weigh it down against the efforts of the wind; a successful strategy. Many people passed me by; a few paused (I cannot be sure how many, for there was a vantage point behind me), and a couple of individuals made conversation. Both were elderly gentlemen with local accents; one spoke of the weather and a car accident; the other told me how his uncle had saved the engine house from "Bevin's Boys" during the war. I had spent rather too long exploring the area (seeking that "perfect" painting pitch), with the result that I was still painting after 4 o'clock, when it started to get a bit cold. The light had changed rather by then, too, particularly on the sea. I made a few allowances in the direction of the additional reflections before packing up, but I'm not sure that I should have done. The painting is a view of a pumping engine known as Cargodna, part of the West Wheal Owles sett of copper mines that also includes Wheal Edward. It is readily accessible on foot from the car park at the Botallack mine; the mines are owned and maintained by the National Trust. In retrospect, I should have focused less on the building, and more on the surrounding landscape - which is utterly stunning, and would have given the engine house more context. 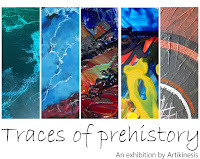 Still, I have lots of photographs, and there may yet be other opportunities to take my painting kit back to the site. The mine is the site of a tragic mining disaster, memorialised on a stone close to the pictured building; in January 1893 a team of miners working in one of the undersea levels accidentally broke through into the flooded workings of another, abandoned mine. 20 of the men died and their remains were never recovered. More information on the incident is available here. Beautiful! I love the way you've painted the texture of the stone, Amanda. And congratulations on the magazine article! Thank you, Sarah - although I still think that I haven't done it justice.